Week 17 This week the last 2 sections of deck. The middle section of deck went on without problems. A pencil mark in the middle of the aft end made sure it went on straight. Unfortunately the aft section wasn't quite to co-operative. It was a tad short. The 2 options were either to let it come forward a little, but as A deck is suppose to finish directly above the end of B deck I didn't like this. The alternative is to move the deck aft, which will leave a small gap to be filled. However, since this will be fairly well hidden by the A deck cabins, I went for this option. The hull has got it's first complete set of decks now - give yourself another pat on the back and prepare to plank the hull. 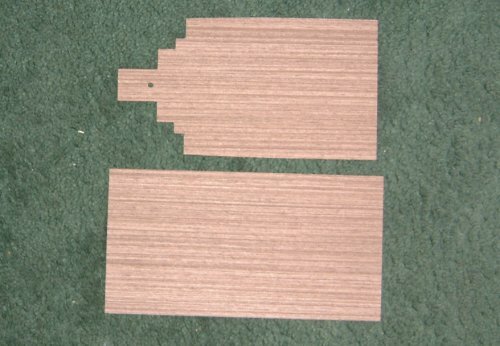 To make filler exactly the right colour, collect some sandings from the same wood and mix with white glue. Be prepared to do this twice as it tends to shrink.